There are three basic types of Southwestern soil: Clay, Sand and Loam, or a combination of these. All of them are generally alkaline and have little-to-no of the organic nutrients and organisms needed to sustain quality plant growth and production. That means that most all local soils need to be amended, and the type of soil you have dictates what type of amendment is needed, and in what quantity. Typically, for Clay and Sand soils, we recommend mixing equal amounts of Payne’s Soil Conditioner and Payne’s Premium Compost at a 50-50 ratio with the existing soil. You will need to spade or rototill these additions into the soil. Caution: If you’re planting a fruit or vegetable garden, we do not recommend using soil amendments that contain cow manure. That’s because of the possibility of the manure containing ecoli, Salmonela or other harmful bacteria. It’s fine to use manure mulches for other, non-edible plants. Almost all plant roots need oxygen to survive, and adding organic matter to clay soil helps loosen it so that more oxygen can be held in the root zone. When a plant is said to be tolerant of clay soils, it means it has adapted survival mechanisms to thrive in oxygen-poor soil. 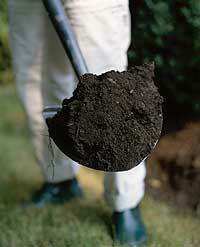 Clay soil is called “tight” soil because it does not drain very quickly. An easy way to determine if the soil is clay is to dig a hole and fill it with water. If it takes a long time for the water to drain out, it’s clay soil. Another good test is to collected a fistful of moist soil, squeeze it together as tightly as you can, then carefully place it in the sun to dry. If it sticks together and becomes quite hard, you have a high content of clay in your soil. If the soil is whitish in color and quite hard it may be Caliche. This is another form of Clay and it is the most difficult type to adequately amend to sustain healthy plant growth. However, it definitely can be done! In addition to the 50-50 ratios mentioned above we also recommend adding Aluminum Sulphate to the soil at a rate of approx. 1 lb. per 100 sq. ft. This should be repeated annually until the correct pH of 7 is achieved. Once a pH of approx 7 is achieved, then semi-annual applications of Sulphur and Iron Sulphate is recommended. Sandy soil is known as a “loose” soil because the water drains through it too quickly and dries out before the roots can absorb what is needed. The very same remedy for correcting clay soil is needed here, but instead of opening the soil, the organic mater will help retain moisture at the root zone. Finally, if you have loam to garden in, you’re very fortunate. Although it’s rare in the Southwest, it does exist. 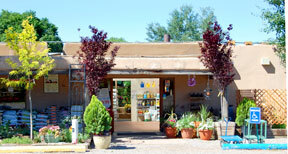 You will still need supplemental additions of compost and mulch but at lesser quantities and less often. If you need to have your soil tested, take your soil sample to the Santa Fe County Extension Office (505-471-4711) or send it to New Mexico State University for a laboratory analysis. This type of test will tell you the pH as well as N-P-K levels which is very useful information.